I… Dreaming occupies an atypical position within the work of Stan Brakhage. Out of nearly 400 films made between 1952 and 2003, I… Dreaming is one of around only 30 which have a soundtrack, the rest being silent (1). It consists of home-movie footage (Brakhage picking his toenails, his grandchildren playing), accompanied by a soundtrack compiled by Joel Haertling of Stephen Foster songs (2). Typically, Brakhage’s films eschew classical Hollywood style, avoiding traditional depth perspective through a variety of techniques. However, in I… Dreaming most shots are composed in depth, and the spectator is even able to construct a three-dimensional space from the differing angles on the family house shown. While these attributes may not be unique in his work, they mark the film as unusual. Brakhage’s work is often understood in exclusively visual terms – an approach encouraged by such pronouncements in his writing as “Imagine a world before the ‘beginning was the word’” (5) – as if his films existed in a pre-linguistic, infantile state. Yet Brakhage was a keen consumer of poetry (his writing is filled with references to poetry and poets) and as a child he intended to become a poet. I… Dreaming demonstrates Brakhage’s love of language, with the use of the songs’ lyrics which are scratched into the film surface throughout the film, and even the I/eye pun of the title. I… Dreaming treats its musical accompaniment in much the same way as the physical film, “cutting” from one musical phrase (or even song) to another at unexpected moments, juxtaposing the quiet and loud, fast and slow, just as the images cut from light and dark, movement and stasis. The “jumping” of the music, as if it were a scratched record, also makes the spectator aware of the medium itself, intimating that this is a recording and not a live performance, just as the scratching on film destroys the illusion of the otherwise mimetic images. The use of music in I… Dreaming is not purely formal, however; it also contributes thematically to the film. I… Dreaming depicts Brakhage as an old man, wearily standing up or sitting down, contrasted with the restless activity of the children. 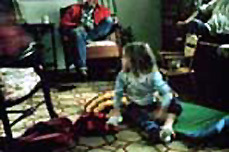 This can be interpreted simply as illustrating his distance from his grandchildren, but also as simulating his memories of childhood, the treatment of the film and music (shifting in time and space) being analogous to the action of memory, prone to jumping from one moment to another (this reading is reinforced by Brakhage never appearing in the same shot as the children). Perhaps it is because of his recent death (he died in March 2003), but I… Dreaming also seems dominated by mortality – the vitality of the children, emphasised by time-lapse photography, contrasted to his inertia. The melancholy music plays an important role in this, and Brakhage chooses to highlight key phrases from the lyrics by scratching them into the frame. The children are associated with expressions like “sweet spirit” and “love,” whilst Brakhage is associated with portentous phrases like “waiting” and “see the dark void”. A further element is the contrast between light and dark. Several shots alternate between light and dark as the aperture on the camera is opened and closed, and the screen turns completely black, plunging the spectator into the “dark void” of the lyrics. Despite its brevity, I… Dreaming is an emotional experience. Its most poignant moments are those repeated shots, seen once with Brakhage in frame, then repeated without him, that provides a fitting visual metaphor for his palpable absence, the empty space he has left in the world since his death. No definitive Brakhage filmography exists. However, Fred Camper’s online version based on the work of Scott Macdonald is sufficiently detailed for my purposes. Foster was a 19th Century songwriter, perhaps most famous for “Oh! Susanna” (1848). Haertling is a librarian in Boulder, Colorado (Brakhage lived for most of his life in Colorado) as well as a member of Architects Office, “a volunteer electroacoustical intuitive music making performance and recording group”. See P. Adams Sitney, Visionary Film: The American Avant-Garde, Oxford University Press, New York, 1974. Stan Brakhage, “Metaphors of Vision,” Film Culture no. 30, 1963, p. 21. Malcolm Cook holds a BA in Film and Literature from the University of Warwick and is currently studying for an MA in History of Film, Television and Visual Media at Birkbeck College, London.